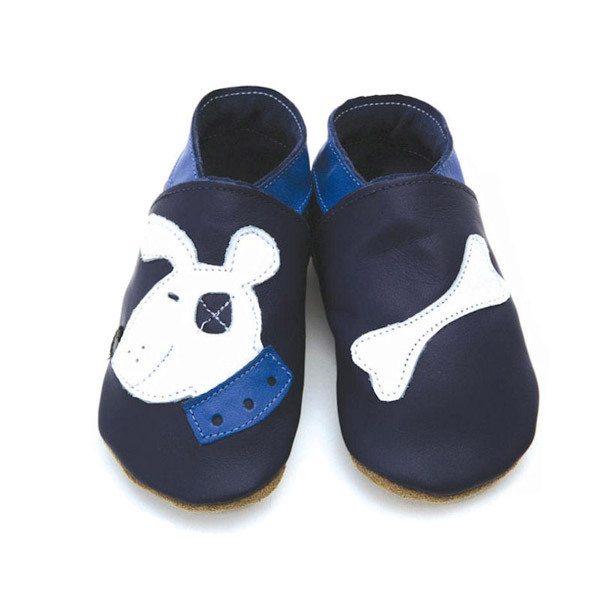 Soft leather baby shoes in navy with Patch Bulldog and bone design. These shoes really do stay on ! the elasticated ankle means no fastenings to come undone, slip on and stay on. Bare feet are best for babies but not always practical. Our leather shoes let feet breath, allow natural flexability, movement and growth, while keeping little toes safe and clean. Softy leather uppers and suede soles for grip, our shoes are 100% leather. Hand or machine (machine with the same color), with a mild, low temperature. Ultra-fast drying in the open air. Place a cloth soaked in milk on a leather will have a renewing effect. To maintain the anti-slip side of the sole, simply suede brush to remove any dirt to make it smooth. Starchild baby shoes and slippers are made with love and creativity from 100% leather, with baby soft leather uppers and buttery soft suede soles. Soft leather makes baby feet and toes breathe happily and stay healthy! Starchild baby shoes are recommended by mums and pediatricians as they are the nearest alternative to having bare feet thanks to the thick suede soles. The elastic straps and Velcro closures keep Baby’s socks on. They can not be kicked off and ensure that the shoes really do stay on! Therefore Starchild shoes and slippers can help Baby gain confidence while taking his first steps. Another key feature: The thermoregulating properties of leather keep Baby’s feet warm in the winter and cool and dry in the summer. Moreover, Starchild baby shoes and slippers are produced from a natural renewable sustainable source which is a good news for the environment when compared to their synthetic friends. In its British factory, Starchild uses Italian leather, tanned using no harmful chemicals or dyes, and meeting European safety and product standards. All colors that are used by Starchild are completely non-toxic and environmentally friendly! To sum up, Starchild provides exceptional design, quality and hand craftsmanship.